" Officials: Cheney Criminal Probe Mandated by Law	"
The judicial branch...has determined that waterboarding is torture...The Bush administration has admitted to waterboarding captives. The corpus delicti of that crime exists. For there to be investigation now is unexceptional. The only exceptional thing is the parties involved: the former vice president of the United States, his counsel David Addington, Office of Legal Counsel (OLC) lawyer John Yoo and their private contractors Bruce Jessen and Jim Mitchell, psychologists who designed the torture program. During a Sept. 2, 2009 segment of MSNBC's Countdown, Keith Olbermann interviewed Whitehouse about his National Law Journal piece (video below) and quoted former Attorney General Alberto Gonzales, who praised Attorney General Eric Holder's appointment of a special prosecutor to investigate CIA employees who exceeded the guidelines contained in the infamous Office of Legal Counsel (OLC) torture memos. The law says very clearly that it is the obligation of the attorney general to investigate, to see whether crimes were committed any time there is torture under American jurisdiction. He must do that. If he didn’t do that he’d be breaking the law. He was then abruptly interrupted by the Fox interviewer. Anyone who has read my five-part series, "History of CIA Torture: Unraveling the Web of Deceit" (Part I, Part II, Part III, Part IV & Part V), will understand why I welcome recognition by these two members of Congress of Holder's legal obligation to "look back" as part of a criminal investigation of any and all individuals who either authorized, conspired to commit or committed torture. But that recognition falls short of a full understanding of the scope of CIA torture and the direct and immediate role that Congress should play in restoring the rule of law. Whitehouse's assessment that the corpus delicti, essentially the body of a crime, is already established and that an investigation of all who may be implicated in ordering, conspiring, or committing torture is "unexceptional" should carry a great deal of weight given that Sen. Whitehouse previously served as the Attorney General of the State of Rhode Island and also served as a United States attorney. 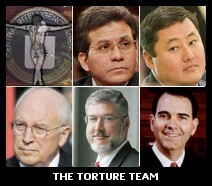 What is troubling, however, is that Whitehouse's suggestion that psychologists* Jessen and Mitchell "designed the torture program" reflects that a sitting United States Senator does not realize that the CIA techniques were not first developed when the Bush/Cheney regime called upon these two psychologists to "reverse engineer" the military's Survival Resistance, Evasion & Escape (SERE) techniques. The CIA's development and application of CIA torture techniques occurred over a span of nearly sixty (60) years, dating back to the 13-year, multi-billion dollar project to crack the code of human consciousness, which culminated in the CIA's 1963 KUBARK torture manual. Whitehouse would do well to read my five part series on the "History of CIA Torture," as well as the more extended academic studies, like Prof. Alfred McCoy's A Question of Torture: CIA Interrogation, from the Cold War to the War on Terror . There is substantial evidence of a back channel between Addington and Yoo. It is not yet clear what information or instructions passed along that back channel. It does appear to have sidelined regular chains of reporting, including the attorney general. Investigation would determine whether this was communication or conspiracy. This seemingly innocuous notation says a great deal. As revealed by Jane Mayer’s July 3, 2006 New Yorker article, "The Hidden Power,” the former Vice President and his chief legal counsel...David Addington were the driving force behind the Bush regime's unprecedented claims of dictatorial executive powers. Under Whitehouse's analysis, this makes Gonzales, as well as Addington, a potential co-conspirator. It provides context for Gonzales' praise of Holder's decision to appoint a special prosecutor who would look only at those who exceeded these sham quasi-legal memos. That praise for the decision to only go after "a few bad apples" reflects a desire to save his own skin. Though the next day, Gonzales completely flip-flopped on his original statement, "I think it is legitimate to question and examine that conduct to ensure people are held accountable for their actions" to completely reverse the record by asserting: "I don’t support the investigation by the department because this is a matter that has already been reviewed thoroughly." But in pointing only to Holder's duty to prosecute, both Nadler and Whitehouse overlook the responsibility that Congress has in this matter. Jay Bybee is a sitting judge on the federal appellate bench. Nadler, as a member of the House Judiciary Committee, is in a position to initiate articles of impeachment. Why hasn't he, or any other member of the progressive caucus, done so? While Professor Turley was correct when he noted Holder's chiseling special prosecutor offer negates the principles our nation followed at Nuremberg, the failure to hold those who ordered these war crimes accountable, especially Cheney, has far more sinister implications. It amounts to nothing less than to establish a precedent that a President or Vice President can get away with cold blooded murder. It renders hollow any claim our current President and Attorney General can make that we are a nation of laws. It reinstates a long discarded principle that "the King can do not wrong," and it betrays the core principle of equal justice under the law, which generations of Americans have fought and died to preserve. *A recent piece appearing in the UK's Guardian contains allegations made by the group Physicians for Human Rights that American physicians, in aiding torture, engaged in practices that approached unlawful experimentation on human subjects --- a third rail for physicians that violates the Nuremberg charter and which resulted in the post-World War II prosecution of Nazi physicians. As revealed by Dr. Steven Reisner on Democracy Now, the "experimentation" allegation arose in the context of physicians assigned to gather data on the most effective means of water boarding. UPDATE 09/06/09: In an op-ed published today in The New York Times former FBI Agent Ali Soufan noted that the torture apologists were "fast running out of classified documents to hide behind. The three that were released recently by the C.I.A...fail to show that the techniques stopped even a single imminent threat." Soufan described the so-called "enhanced interrogation" program (a euphemism for "torture") "ineffective, unreliable, unnecessary and destructive." It was more than that. It was a crime which should be investigated and punished like any other crime. We are either a nation of laws or a nation where the King can do no wrong. The rule of law can be preserved only where there is equal justice for all. « PREVIOUS STORY "DIEBOLD FINDS ELECTION DIVISION BUYER; ES&S TO CONTROL MOST U.S. ELECTIONS"
"Officials: Cheney Criminal Probe Mandated by Law"
Sorry, but don't hold your breath. It's like the Mafia investigating the Mafia. It's a show. No change, here. The Republicans screwed us and the Democrats punk'd us. Snore. Mr. Canning the Bush/Cheney assasination began in September/October of 2001 when a reporter in Florida was infected with anthrax (a strain that was pattented by the Army) and killed. Also some Democrats were targeted. No real investigation yet. The American Taliban (Republican) Party will always fight to keep everything under wraps. And your evidence for Bush/Cheney being responsible for the death in FL, Don? Mind you, I've been rather vigorous around here in calling out the flaws in the Anthrax investigation, and believe it's still quite likely the killer roams free. I'd also not put it past elements of the Bush/Cheney cabal to do anything. But as to actual evidence for the allegation you make --- that Bush/Cheney assassinated the reporter in FL, and attempted same with the Democrats who were targetted with the same strain of anthrax --- well, I'm unaware of any. Of course, feel free to share. Our Government is knowingly hiding truths. I think its a little naive to act like not toruting is in the DNA of this country given what this country did to the native people, God only knows what type of torture slaves and share croppers endured at hand of thier masters/employers, and more recently all the horrific things the CIA and others have done in foreign countries. However, I like the idea that patriotic American guy had this idea that America is and should be above torturing people. Probably because we were relatively decent to Germans in WWII comapred to some other armies in recent history. Hey, that's great, lets get everybody in US thinking we are morally superior because we actually act in a morally better way. I think the sunlight of a a thorough, methodoical investigation that gradulally works it way up the food chain along with some distance from 9/11 and some more facts about torutre and history in US will go along way towards gradually movign public opinon on this. If we as individuals can reflect on our own actions after the fact and determine what we did was an wrong overreaction in the heat of the moment, I trust US population can also come around on the subject of torture. To that end, great work Brad and your excellent summaries and history of this. Thanks so much for doing this Mr. Canning. Oops. Not that I don't appreciate this article but I had several pages open and I meant to put this comment at the end of your series on CIA torture. So thanks for that.